As you may have seen, my work as an environmental geologist takes me into a lot of distressed environments. Usually urban. I see the the consequence of negligent fathering all the time. Sometimes it gets pretty horrible. I think our prisons would be nearly empty if more men lived up to the responsibility of being a dad. I can’t imagine why they don’t. I have told my two children, that my life was pretty amazing before I had kids – I climbed often, wandered around in mountains, rode my motorcycle all over the place and enjoyed real adventures. However, when I became a father, life got boosted up into a higher orbit and became even better than I could have ever imagined. It was like the beginning of the Wizard of Oz…all the sudden I could see in color. Being a dad is the absolute best part of my life…and it is the true value of my life. Let me leave you with this… I work for myself and have my office in the basement. 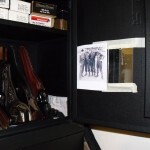 I have a gun locker in the office which holds mostly family artifacts (my grandfathers shotgun, my fathers police revolver and his side arm from WWII etc). The locker has an upper door for a cabinet that holds smaller items – pistols etc. The door is head height. I have two items taped to the inside of that door at eye level: a plastic camping mirror and a photo of my father with his buddies during the war. When I need to get my bearings, I open the gun locker, look at the man in the photo and then I look at the man in that little plastic mirror and compare the two. It is my compass. It reminds me of who I am, what I am suppose to be, what my mission is and what I am made of. My compass always reads true because my father was a good man. I pray that I can be of similar service to my children. Thanks for sharing, Michael. Although I don’t possess a gun locker, I have several pictures of my dad that I occasionally look at for inspiration as well. It’s always good to have that ‘compass’ handy.